It's time to Skype-in to the Gliebers Dresses Executive Meeting. Glenn Glieber (Owner): "... it's just common sense, folks. If we can get every fifteen year old in America to purchase her Quinceanera Dress from us, we steal market share and we'll hook the customer for life. Sarah's been saying for years that our customer file is too old. And think about the marketing opportunities. We could get Miley Cyrus or Hillary Duff to do an interview, and then publish the interview in our catalog. The kids love those two, right? We could probably even sell the catalog at the checkout in the grocery store, $4.00 or something like that, people would just love that! We could have a special Twitter thingy to build community among the kids. This idea would probably go viral, wouldn't it? Quinceanera for the Hispanic community, and then there's the Sweet 16 opportunity, too!. Brilliant! Sarah, I'd like to see the marketing plan for all of this by early this afternoon. Great idea, Pepper!" Glenn Glieber: "Kevin, do you have a tidbit for us to consider today?" Kevin: "I have a few tidbits about the future sales trajectory of your business." Roger Morgan (Operations): "I hope you factored in the impact of the economy, Kevin. Woodside Research says the economy will bounce back in Q1-2010. If I were you, I'd apply a 10% bump to any forecast your developing, just to factor in the likely impact of a global economic resurgence." Kevin: "Well, I think ..."
Lois Gladstone (Finance): "Didn't we factor in a 10% bump in our 2007 forecast, and then buy a whole bunch of inventory to meet the forecast, and then get our rear end handed to us when we had to liquidate all that stuff when sales didn't hit the forecast? Didn't we end up having that big tent sale in Birmingham to get rid of all that junk?" Meredith Thompson: "It wasn't junk, it was a bad forecast." Sarah Wheldon (Marketing): "Oh, that was a cold day. 39 degrees on December 15 in Birmingham, and we're trying to move three million in excess dresses under the guise of a Christmas blowout sale inside a tent next to an abandoned K-Mart store. Roger Morgan: "Good hot dogs, though. We sure sold a lot of hot dogs." Kevin: "Speaking of selling, I'd like to share a slide with you. 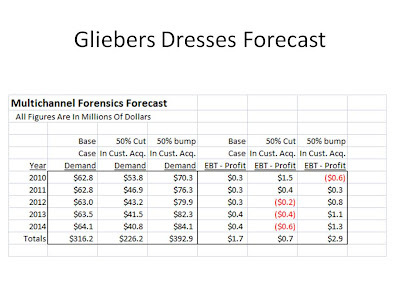 This slide shows where Gliebers Dresses is heading over the next five years." Glenn Glieber: "What does this tell us, Kevin?" 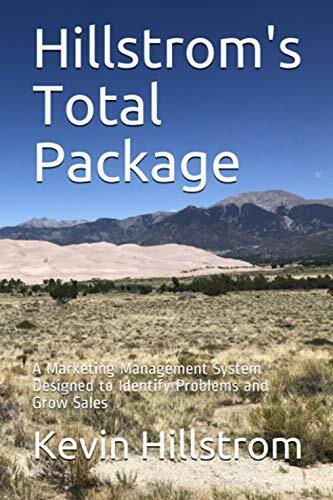 Kevin: "Given your current base of customers, your current online marketing strategy and catalog mailing strategy, and your current customer acquisition strategy, the data tells us that your business has stalled. Unless there is a significant improvement in merchandise and creative productivity, the business is stuck at about $63 million in annual demand, and will eek out a tiny profit each year." Lois Gladsone: "How can you know this, Kevin? My team produces the sales forecasts for the company, and we aren't showing a trend like this." Meredith Thompson: "And obviously you haven't taken into account our Quinceanera promotion, or the emerging prom business. I don't know how you dream up numbers like this without any context whatsoever." Kevin: "Let me ask all of you a question. Didn't you have initiatives and promotions and strategies for each of the past three years? And didn't you feel optimistic about those strategies before executing them? In spite of optimism, this business lost a ton of volume and profit over the past three years. Regardless of initiatives and promotions, there is a natural rhythm to business. The customer has a 53% repurchase rate, buys twice a year, and spends $137 per order. And you spend about $6.5 million acquiring new customers. Given these dynamics, I can generate reasonable forecasts." Pepper Morgan (Creative): "What do the columns mean, Kevin?" Kevin: I ran three scenarios for you. The first scenario looks at where your business is heading over the next five years. The second scenario looks at what happens if we reduce customer acquisition spend from $6.5 million to $3.3 million." Lois Gladstone: "Ah, yes, get rid of all that unprofitable customer acquisition spend. And look what happens. The business is instantly more profitable!" Kevin: "For a year or two. After that, your business is starved of new customers. Your business shrinks. And your business becomes unprofitable, because you don't have enough business from existing customers to cover your fixed costs." Lois Gladstone: "But that's just a guess, right?" Kevin: "An educated guess based on the way your existing customers behave, coupled with your expense structure." Lois Gladstone: "Yeah, but, we'd invest that money in loyalty programs, and that would cause our customers to become more loyal, and that would increase sales and profit. Kevin: "That's a hypothesis that we'd have to either prove or disprove. Now take a look at the last set of columns. Here, we increase customer acquisition by 50%. And we take a bath during the first year. But by year five, this business is growing and is more profitable." Glenn Glieber: "Here's my problem, Kevin. We simply cannot afford to invest almost $10 million in customer acquisition under the promise that the business will be stronger in five years. We don't have any cash to do that. Where do I find an additional $3.2 million to spend acquiring customers who are even less profitable today than the ones we're already trying to acquire? If anything, I need to reduce marketing spend to keep the business afloat." Lois Gladstone: "I'd cut the customer acquisition spend, and then re-invest it in customer retention activities." Sarah Wheldon: "Describe the retention activities you're thinking about?" Lois Gladstone: "Like a frequent buyers club ... buy five dresses and get the sixth one free, or buy three dresses and get free shipping for the rest of the year. Something to hook the customer to us, that's what we need." Meredith Thompson: "Does the customer buy from us because of the merchandise, or because of gimmicks?" Lois Gladstone: "Kevin, on Wednesday, could you run a scenario where we cut customer acquisition activities by 50%, and then we invest $1,000,000 of the customer acquisition money in a loyalty program that improves customer loyalty by 10%? Would a scenario like that be more profitable than what we are doing today?" Kevin: "Sure, I'll be happy to do that." Glenn Glieber: "Another great Multichannel Forensics tidbit! Thanks for hopping on today, Kevin, we'll see you on Wednesday.. Now, on to new business. I received an awful lot of complaints about the shampoo that was used to clean the carpets last week. Seems that several employees think the shampoo was toxic and caused rashes on the ankles and shins. Roger, we need a shampoo solution. Doesn't Costco have some 'green' shampoo that we could use, helping us save the planet while at the same time minimizing the risk of rashes?"